Edema (oedema) and intumescence are not caused by pathogens and are not transmissible from one plant to another. They are physiological responses to specific stimuli. These two conditions are often mistaken for one another; however, research indicates that they are caused by different environmental factors and plant physiological responses. While edema is considered to be the result of an imbalance in water relations within a plant, intumescence is associated with low ultraviolet-B (UVB) radiation. Both of these conditions are commonly seen in the spring during prolonged stretches of cloudy weather. Intumescence and edema both appear as small, bumpy protrusions on the surface of leaves, petioles, and stems of affected plants. The bumps may be green, white, or tan depending on the host and severity of the condition. 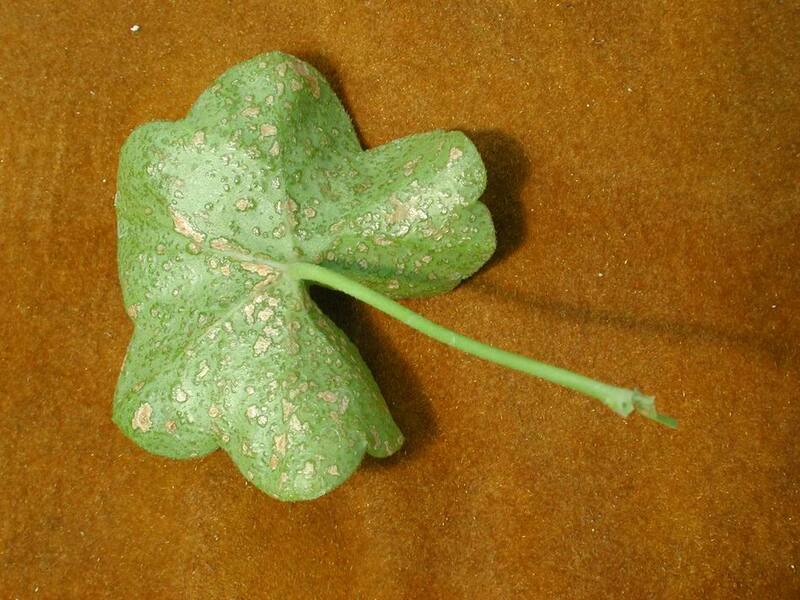 Symptoms may be mistaken for galls formed by eriophyid mites; however, mites will be absent. Edema is most typically observed on the lower leaf surface, while intumescence may be seen on lower or upper surfaces. Symptoms of edema occur on leaf tissue between veins, while intumescence can occur in between or directly on top of the mid-rib and major leaf veins. Plants susceptible to edema include ivy geraniums, sweet potato vine (ipomoea), tomatoes, peppers, begonias, cacti, ferns, palms, pansy, cleome, and cole crops like broccoli, cabbage, and cauliflower. Some succulent plants such as jade and peperomia are also sensitive to conditions which lead to the development of these symptoms although almost any broadleaved plant may be affected. Intumescence is commonly seen on sweet potato vine (ipomoea), tomatoes, peppers, kale, Cuphea, and Thunbergia. Both edema and intumescence are temporary reactions, and once the weather impoves, new growth will be asymptomatic. Edema blisters form on ivy geraniums when water and solutes build up underneath or possibly within cells, causing the epidermal cells to stretch and collapse. The cells do not rupture as was previously thought. Symptoms of edema appear as bumps or blisters initially on the undersides of lower or older leaves on a plant. They may then turn brownish or tan and become corky. Severely affected leaves will often turn yellow and fall off the plant. The corky spots sometimes resemble spider mite or thrips damage. To rule out pest damage, growers are advised to use a handlens and check carefully on the undersides of leaves along midveins for spider mites and in growing points for thrips. Mildly affected plants often recover from edema, putting out symptomless new growth in late spring and early summer. Severely affected plants may drop significant numbers of leaves and have badly distorted remaining leaves. These plants are probably not worth saving as they will not recover in time for sale. Several studies have reported that edema on ivy geraniums occurred when the growing media remained warm and moist and the greenhouse air was cool and moist. The plant roots absorbed water at a faster rate than was transpired through leaf tissue, causing leaf cells to rupture. This rupturing of the leaf epidermis and the inner cells is believed to cause the raised, blistered appearance on the underside of the leaf. Use well drained growing media. Increase light exposure by properly spacing plants. Avoid overfertilizing, especially of slow-growing plants. Water prudently (not too much, not too little) during extended periods of low light and cool temperature. Reduce humidity by venting the greenhouse first thing in the morning, even if that means turning up the heat. See "Reducing Humidity in the Greenhouse" in the Nov./Dec.2003 issue of Floral Notes. When using containers that have snap-on saucers, delay putting the saucer on until the crop is nearly finished. Place varieties with similar growth vigor on each irrigation line or section, again to eliminate overwatering. Select ivy geranium cultivars that are less susceptible to edema. Table 1. Ivy geranium cultivars categorized by susceptibility to edema as published in 1993 in Geraniums IV . Table 2. Susceptibility of ivy geranium varieties to edema, grown in the Rutgers University greenhouses in 1995. The plants were visually rated on a scale of 1-10 with 1 being highly susceptible and 10 indicating few symptoms. * These plants were grown and evaluated in a glass greenhouse. Delay application of shade cloth or shade paint in spring. Select cultivars that are less susceptible to intumescence. In recent research by Kansas State University, ornamental sweet potato cultivars were screened for susceptibility to intumescence. Out of 36 cultivars tested, 19 did not show any symptoms of intumescence development. According to the research, susceptible cultivars included 'Blackie', 'Black Heart', 'Desana Bronze', 'South of the border chipotle', 'Sweet Caroline Bronze', 'Sweet Caroline Sweetheart Red' and 'Tricolor'. 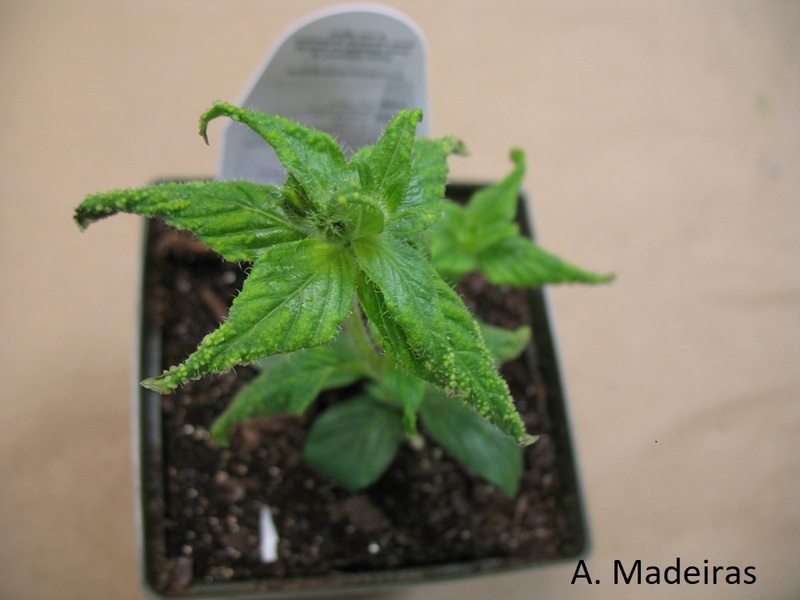 For information see the article: Intumescences: Further Investigations into an Elusive Physiological Disorder in the September 2014 issue of Greenhouse Product News Magazine. Rud Nicole Ann. 2009. Environmental Factors Influencing the Physiological Disorders of Edema on Ivy Geranium (Pelargonium Peltatum) and Intumescences on Tomato (Solanum Lycopersicum). Department of Horticulture, Forestry and Recreation Resources, College of Agriculture, Kansas State University. Craver J.K., Miller C.T. and K.Williams. 2013. Intumescences: A Physiological Disorder of Greenhouse-Grown Crops. Greenhouse Product News. Dec.
Craver J.K., Miller C.T., Gabriela Cruz, M. and K.Williams. 2014. Intumescences: Further Investigations into an Elusive Physiological Disorder. Greenhouse Product News. 24(9), Sept.issue pp 32,34, 36, 37,38,40.